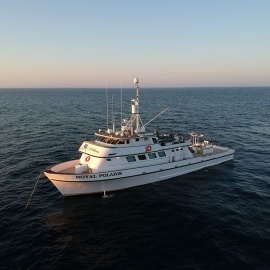 Welcome aboard the Royal Polaris, considered to be the finest long-range Sportfishing vessel in the world. From summer Albacore, to Yellowtail and Wahoo, to giant Yellowfin Tuna, our catch record is unmatched. The crew and owners of the Royal Polaris especially welcome those individuals making their first long-range trip. When you fish the Royal Polaris, you benefit from every advantage with our unmatched service, speed of vessel (which maximizes fishing time), and the added comfort enjoyed aboard the finest riding sportfisher in San Diego's long-range fleet. Our first priority on the Royal Polaris is to make your trip a memorable and happy experience. We guarantee the finest service in the fleet. Owners/Captains Frank LoPreste and Roy Rose, Captain Jonathan Yamate, along with our crew members Dharyl Shelbourne, Eddie Felarca, Chris Garcia, John Collins, Jim Hughes, Terence Willis, Deron Kochis, and Ben Amboy offer unmatched expertise in long-range sportfishing. Chefs James Wagar, John Smith, and Kenny Kato provide a first-class dining experience throughout the trip. This outstanding crew is well known for leading the industry in its innovative fishing methods, and is always happy to share that knowledge at the rail and each evening, before dinner, when we recap the events of the day and discuss the next day's fishing plans. 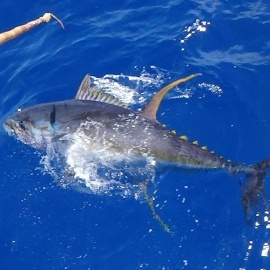 When you fish the Royal Polaris, you benefit from every advantage with our unmatched service, speed of vessel, (which maximizes fishing time) and the added comfort enjoyed aboard the finest riding sportfisher in the San Diego Long Range fleet.